Courtney Duncan is earning an M.S. in Food Science at the University of Missouri. They say that if you love what you do, you will never work a day in your life. If that thing you love is wine, life is bound to be exciting. This is the case for Courtney Duncan, a second year masters student in Food Science working with The Grape and Wine Institute. Over the years, Duncan’s love for wine turned into research and a career. After learning about wines and tasting in hospitality and food sciences courses during her time as an undergraduate at Virginia Tech, she was hooked. 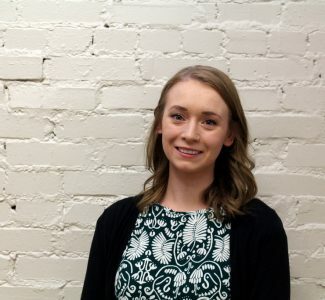 Originally from Fairfax County in northern Virginia, Duncan made the move to Missouri after being offered an internship at St. James Winery where she became particularly interested in Missouri wines. While at St. James, she was introduced to the Viticulture and Enology program at MU and thought that it was the perfect fit for her research interests. “I realized that there was a space for me here at Mizzou to conduct the research I was interested in doing.” Mizzou was the next logical step in her exploration of local wine grapes. Duncan’s research is timely, as the wine industry across the country is booming. This is in part related to the increase in wine consumption by the millennial generation. Recent pushes to buy local food and drink products have led to an influx of small wineries in many regions, including Missouri. With the industry growing, many wine makers and growers in the US are looking to perfect their product and practices in order to compete with European grapes. Duncan hopes to do just that by studying the Norton grape which creates a dry, red wine that can be likened to a Cabernet Sauvignon or Cabernet Franc. Coincidently, the Norton wine grape originated in Virginia, just like Duncan, but is has flourished in the Missouri climate. In fact, many Missouri grapes are hybrid species, created to work better in this climate. Missouri does not experience the mild, Mediterranean climate in which many other species of wine grapes grow and thrive. Because it is such a stable crop in Missouri, due to its innate resistance to pests and disease, there is a lot of potential in the Norton grape. “People have said for decades that [the Norton grape] has potential to be a competitive wine in the world market.” However, wine makers still struggle to produce the best wine from this grape. To do this, Duncan samples the grape throughout the harvesting season to better understand it’s ripening process in this region. There are two main grapes that are used for red wine in Missouri: Norton and Chambourcin. “Both are really successful out here. We have a huge viticulture rootstock project going on at Mizzou using Chambourcin that we have had here for a few years,” said Duncan. But Duncan found a space for Norton research at the University, and she launched a small Norton research program with the blessings of her advisors Misha Kwasniewski and Dean Volenberg. Norton is harvested later in the season as compared to other varietals, with ideal harvesting occurring sometime between late September and the beginning of November. However, the perfect moment for picking can vary based on the weather. Duncan hopes to be able to find the best moment to harvest the grapes during the harvesting period. She collects samples from wineries in the state including Stone Hill Winery in Hermann, MO; Augusta Winery in Augusta, MO; Les Bourgeois in Rocheport, MO. Duncan visited each site four times during the harvest in 2015, and seven times during the harvest in 2016 to collect her samples. She took samples for both winemaking and for analysis. In total, she took about 120 pounds of grapes from each location per year, most of which went straight into small batch winemaking. The rest of the samples were analyzed for phenolic content, which is crucial for color and astringency of a dry red wine, organic acids, and various flavor and aroma compounds. Duncan’s research has the potential to greatly impact the local wine industry. Perhaps the knowledge gained from this project will help to make Norton a more competitive wine in the world market, as Duncan hopes. After graduation, Duncan wants to go back into wine production and eventually be a winemaker somewhere. However, she may not always be working with the Norton grape. Though she does not know exactly what the future holds, Duncan has accepted a harvest assistant winemaking position with Michael Shaps Wineworks in Charlottesville, Virginia for the upcoming harvesting season.